GSMArena team, 1 December 2010. The large 4.3” screen with nearly widescreen aspect (it’s 15:9) makes the HD7 a good platform for movie and TV show fans. It’s even better because of the Zune Marketplace, which is a great source for buying or renting movies and TV shows. The kickstand means you don’t have to hold the phone during the movie or episode – which is great since holding the phone for even 45 minutes (the typical runtime for a 1 hour TV show) can be tiring and awkward. Much like the picture gallery, viewing the list of videos can be done in portrait orientation mode only. The video player on the other hand is fixed to landscape only. Another gripe we have with the HTC HD7 video watching experience is that the loudspeaker is on the back so the sound is actually directed away from you. Stereo speakers around the display on the front would have been a much better option. Yet another problem is that the screen is not well-equipped for action scenes – the unpleasant ghosting effect we already mentioned is visible and spoils the experience. The HTC HD7 has no AVI or DivX/XviD support, just MP4 and WMV. However, the Zune software on your computer will automatically convert unsupported video files to .WMV (up to WVGA res). You can watch those formats on the HD7, it’s just that the transfer to the device can take quite a while (depending on your computer configuration). Videos from the Zune Marketplace come in the correct format so they might be the easier option. The HTC HD7 also has a built in FM radio with a dead simple interface. You have the current frequency in very large digits – swiping left and right changes the frequency and a swipe and release automatically searches for the next available station in that direction. The HTC HD7 did very well in our audio quality test. There are no notable flaws when you use it with an active external amplifier - the frequency response is great and so are the noise level, dynamic range and stereo crosstalk readings. 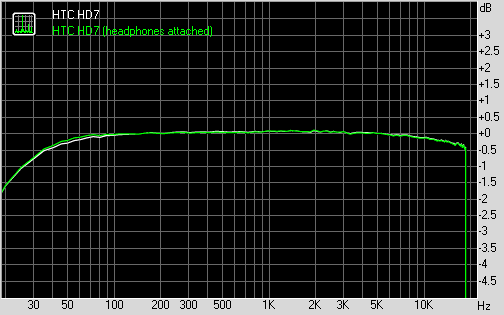 The total harmonic distortion is pretty low too and generally the intermodulation distortion is the only thing about the HD7 ouput that was not particularly impressive (though it's still acceptable). As you could expect things get a bit worse when you plug in a pair of headphones, but the HD7 still maintains a very good performance. As a matter of fact the degradation is so subtle that the device ranks higher up in this scenario, than in the previous. The stereo crosstalk increases and that's about that. There's no extra intermodulation distortion or ferquency response deviations. Now add the fact that the HD7 is pretty loud too and you get the idea that the HD7 is a pretty good music player indeed.